On the winter blot the shadow of the higher stone passes across the lower stone 9.3m away, allowing the shadow to just reach the top of the lower stone. The gradients of the top of the higher stone is in good alignment with the sun’s path. There is a step on the higher stone which means that there are two ways to interpret the date. The shadow from the higher the stone ends up in exactly the right height on the lower stone on February 1st 645 which is exactly one and a half moon cycle after the winter solstice. The step in the higher stone’s shape allows also February 2 to be understood as the right day. There is no problem in seeing how the shadow sweeps across the stone in real time. The next date on which this will occur is Februry 3rd or 4th 2015, between 15:40 and 15:50. These days are 1-2 days after the expected one and one half moon cycle after the winter solstice. 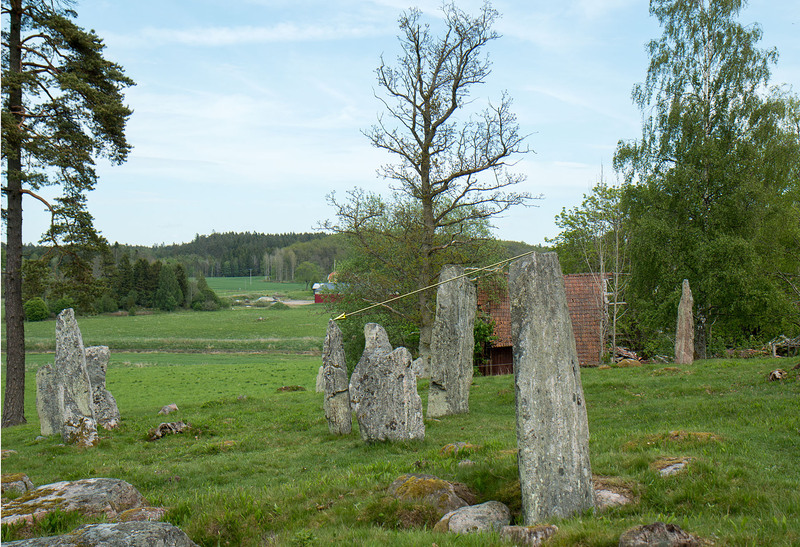 The reason is that the sun’s path in winter today is about 0.2 º higher than in the Late Iron Age and also that the higher stone today is slightly leaning.